The two figures in this mini-review were not sold together in a set, like most of our subjects were. Instead, they were only available single-packed in the Iron Man 2 "counter dump" - but since no stores ever order those things, they might as well have never come out at all. 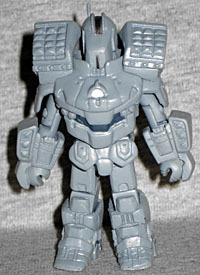 According to the small boxes these figures were sold in, this is not the Sea Assault Drone - it's the Air Assault Drone. The picture on the side of every little box says so. But by comparing these to Hasbro's Hammer Drones, we can clearly tell that this is the Navy variation. It's the giant missile batteries on the shoulders that give it away. There are matching bits on the outsides of the new gloves, but they're easy to overlook in the shadow of those shoulders; even a 1980s businesswoman would find these shoulder pads excessive! While the fronts of the missile bays are the same gray as the rest of the body, the exhaust vents on the back are black with silver outlines. The flexible areas of the suit - or what would be flexible areas, on a real-life thing - are painted a darker gray, perhaps to suggest rubber seals. 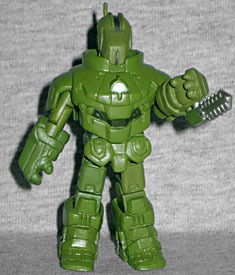 The Tactical Assault Drone is what Hasbro called the Weapon Assault Drone - so in other words, the Marines. It's easy to tell, because when you think of the Marines, what's the absolute #1 thing you think of? That's right, chainsaws on the arms. Oorah! For the most part, the add-on pieces on the Marine Drone are the same as those used to build the Hammer Drone Minimate, which makes sense. So we've got the same boots, the same waist piece, the same chest cap... but a new, narrow head (shared among all the militarized drones) and slightly remolded gloves; the sculpt is the same, but there are now two holes in the back to allow the chainsaws to plug in. Are we sure the designers didn't confuse the Marines with lumberjacks? Collecting the 4" Hammer Drones was not easy, but at least all four of those were actually available in stores (even if it was only in an exclusive multipack). You could get two of the Minimate Drones in TRU sets, but the Sea Assault Drone and Tactical Assault Drone were only available in the counter dump, which means they weren't really "available" at all.